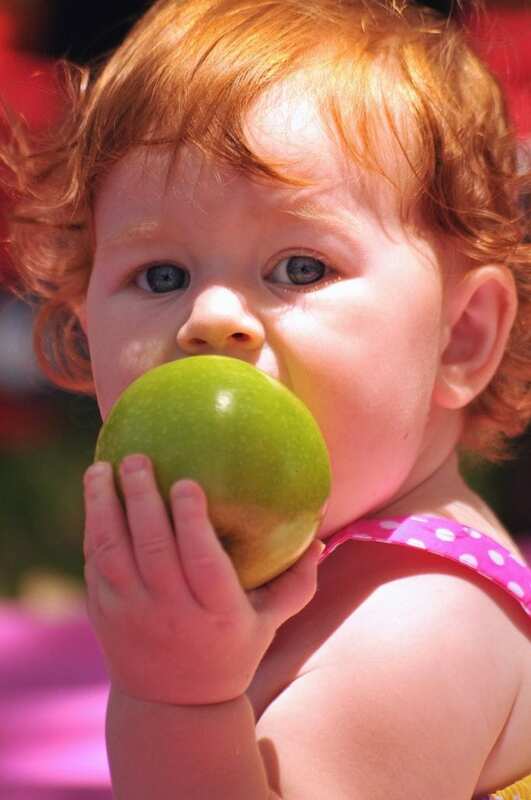 Getting your toddler to eat healthily can be extremely difficult. Of course, all children are different. Therefore, some parents struggle a lot more than others to get their little one to eat anything remotely good for them. No doubt you’ve come across those parents who gleefully tell you about their child’s love of sprouts – making you feel like a complete failure as a mother. Don’t worry though, it’s normal for children to be suspicious of healthy food. The question is, how can you encourage your toddler to eat these foods they seem utterly disgusted by? Below you’ll find 7 great tips that can make mealtimes a lot less stressful for you and your child. A great way to get your little one to eat more fruit is to make it look a little more fun. Carving funny faces into apples for example is a great idea. Toddlers can be intimidated by new foods so if they come with a funny face attached, they appear a lot less scary! You could also do something similar with vegetables. Rather than carve faces into them, arrange them in a unique way on the plate. Kids tend to like to play with their food so if you lay it out like a scene out of a story, they will have a lot of fun acting out the story as they eat. I know what you’re thinking – who has time to grow their own vegetables? Being the parent of a toddler is very demanding, leaving very little time to do anything, even your daily chores! However, taking a little time to grow your own vegetables provides a lot of benefits. The key is to get your toddler involved in the growing and picking process. Not only will your child be excited to taste the vegetables they’ve helped create, but gardening is also very therapeutic and it can really help the two of you to bond. There’s also the added benefit that the vegetables you grow yourself are healthier as they contain no added chemicals. This also improves the taste so even if your toddler isn’t usually keen on the taste of the veggies you pick up at the store, you may find they love the taste of the home-grown ones. It’s a well-known fact that children watch and learn from their parents. So if they see you eating chips, chocolate and other unhealthy snacks, that’s what they’re going to want to do too. If you’re serious about your toddler eating healthy, you have to be willing to do the same. Fill your cupboards with healthy snacks and make sure you all eat the same things at the dinner table. If you pretend you love the taste of the healthy foods on your plate, your toddler will want to love them too. You’d be surprised just how much toddlers enjoy helping out in the kitchen. Sure they may end up making a mess, but preparing meals together is a fantastic way of encouraging them to eat healthy. Just like with the gardening idea, meal time preparation makes your toddler much more likely to try the vegetables if they’ve helped prepare them. You could even give them their own little apron and cooking utensils to make them feel like a proper chef. It’s not just a clever way of getting them to be more adventurous with what they eat – it also gives the two of you a great chance to bond and have fun together. One of the best ways to trick your little one into eating more veggies is to make sure they don’t see them. You can do this by blending them into a delicious pasta sauce or mashing them up into potatoes. If they can’t see them, they’ll be unlikely to taste the difference. This little trick could also work on fussy partners too! Of course, healthy eating is so much more than just ensuring your toddler gets their fruit and veggie intake each day. It’s also down to how much they eat. There’s a tendency to try and get your child to eat their meals as quickly as possible. However, just like adults, children’s tummies don’t register as being full for around 20 minutes. So, if they eat too quickly they could end up whining for more food because they don’t realise they are full yet. So don’t try and get them to finish too quickly. Let them take little breaks if they want to. This really helps to eliminate overeating. 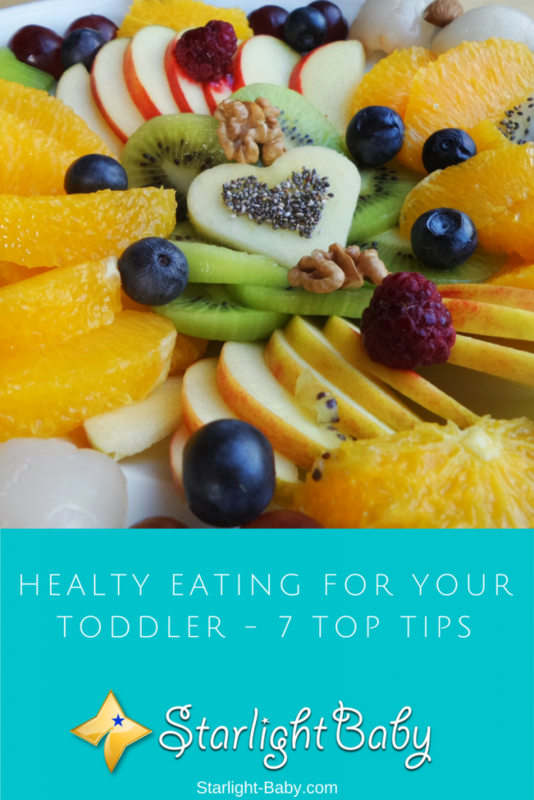 It can be tricky finding the time to eat together, but doing so will make your toddler more likely to eat healthy. They tend to get on and eat whatever is in front of them if everyone else is sat with them, eating the same thing. It also matters what the atmosphere is like around the dinner table so be sure to make the conversation light and fun. This will make your little one look forward to mealtimes and associate them with good family fun. These 7 tips are tried and tested, though you may find some work better than others. All toddlers are different so what works for one may not work for another. There are a few important things to remember when catering to toddlers. At this stage in their little lives, toddlers need a high-energy diet. This means you should provide a diet rich in full fat milk, eggs and meat. It’s also important to ensure they’re getting plenty of good fiber which comes in the form of fruit, vegetables and wholemeal rice and pasta. However, be wary of feeding them too much fiber as this can prevent essential mineral absorption. Overall getting your toddler to eat a healthy diet is all about persistence. Don’t cave in and feed them quick, fatty foods as this will encourage them to refuse eating anything healthy in the long-term. Hi, carving funny faces into is one of the best ideas when our kids are smaller, but believe me, this is not working when they start to grow more. Eating together it works just fine, I know it because I have tried it with my son. That was the only way to make him eat some vegetables or fruits! Now he is ten years old, and this is not working anymore! Wow! It is amazing ways we can get our kids to eat healthy while growing. One good thing about that is that it is going to make the kids grow to be smart kids in the future. I enjoyed reading about this and will put it into practice. Children are very choosy when it comes to eating. Adults can eat anything once they know the health benefits of certain food. However, children do not eat for health. They only eat for the taste. Therefore, a lot of care should be taken to make the food tasty. Children also eat through their eyes, therefore, presentation of food is also important.